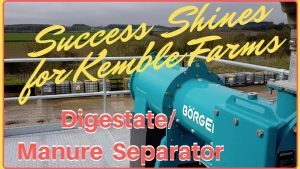 Digestate/ Manure Separators: We are delighted to bring you the news that the Börger Digestate and Manure Separator has been a shining great success for Kemble Farms, in the following Börger solid liquid separation equipment Press Release. Börger sells their solid/ liquid separator technology “biogas separators” as both manure separators, and as biogas digestate separators (i.e. solid/ liquid separators for the output from anaerobic digestion plants (biogas plants) ). Their solid liquid separation equipment design provides a very efficient separation technology. The Börger Separator uses a purely mechanical solid/ liquid separation process, in which liquid parts are split from solid parts in the medium. They also supply high quality pumps to handle all pumping requirements. Some would argue that it might be wrong to put a piece of equipment up on a “pedestal” either figuratively or physically. In this case study Börger has done both! After climbing the steps up on to the ‘pedestal’, well, platform at Kemble Farms in Gloucestershire, there’s a first-class view of the land and the slurry/maize-fed 300kW biogas plant that is testament to continuous improvement. The view of the 1450-hectare farm is also enjoyed by a shining digestate and manure Separator, which looks every inch the part as it separates fibre solids from the digester liquid. 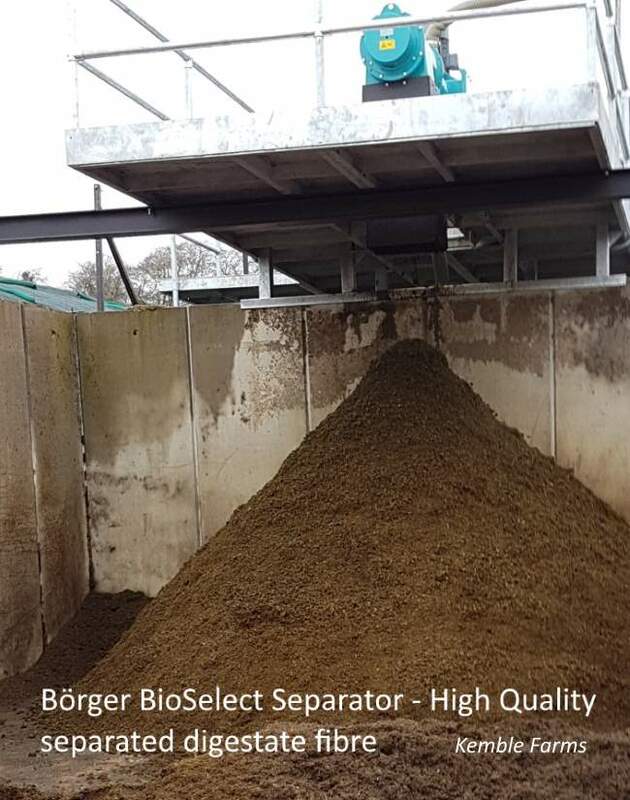 The BioSelect digestate/ manure separator (made by Börger) can be supplied with a Börger high density solids feed pump which is controlled to provide a balanced solids loading to the separator. A second pump is then controlled in combination to pump away the separated liquid. Beneath the Borger digestate/ manure Separator is a sight that pleases Miles Bishop (Kemble Farms’ AD Manager) just as much if not more. Dried digestate, healthy golden brown, slowly, consistently trickling down to form a giant pyramid that is as every bit as perfectly formed as the tray of Ferrero Rocher chocolates in the TV advert! But if this sounds like a frivolous food connection, this extremely good quality digestate is so good that it has substantially reduced fertiliser bills at Kemble Farms, and significantly enhanced the quality of soil in which the maize and grass is grown to feed the near 1,000-strong dairy herd. These cows are clearly content, delivering their best quality and volume of milk. At Kemble Farms, they have worked tirelessly to create a near closed-loop system, utilising the cow’s slurry to maximum effect. “Our existing separator couldn’t cope with the demands made by our AD operation, which began almost a decade ago”, said Miles Bishop. “The old separator required more and more intervention; resealing, replacing the shaft (twice) and the gearbox (twice). 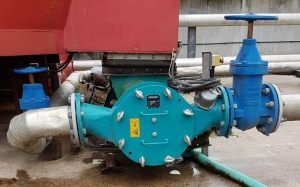 Traditional farm manure separators are just that – but if you’ve diversified into the business of renewable energy, you’ve got to start thinking more about heavy-duty industrial equipment for certain tasks”. 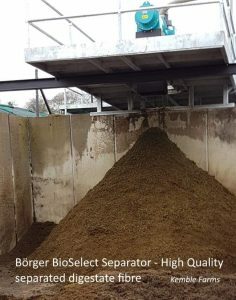 After trialling several digestate and manure separators, Börger’s BioSelect was chosen for its efficiency and reliability. “We’re very happy with its performance”, added Miles Bishop. 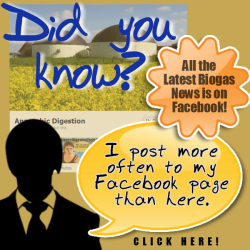 “Crust at the top of our post-digestion tank is now much less of an issue. In this heat-driven process, we constantly have to stay on top of the job. The rising heat dries the surface out – and without the right care and right equipment, a crust, almost in the way of an insulation blanket, will form. When I took on Kemble Farms’ AD plant five years ago, I can remember the crust being a real time-consuming problem. Not so now. Borger manure separator system pumps. Click to enlarge. Things have come an awful long way since then. 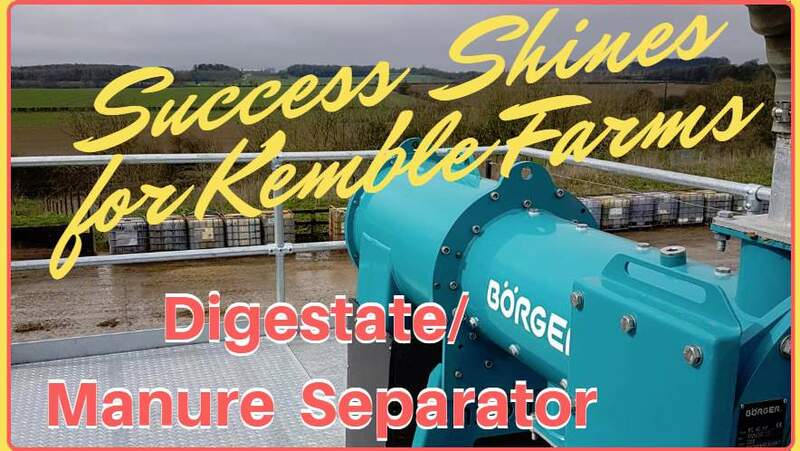 At the front-end of the AD operation, Kemble Farms has also invested in a fully automated Börger Powerfeed, which provides highly efficient solids feeding and mixing technology with 15 cubic metres of storage capacity. The maize feedstock is mixed by a large mixing drum and then fed to a circulation line by the power feeder. The stainless-steel auger compresses the maize into a highly effective plug as it enters the recirculation line, excluding the air as it does so. This method reliably overcomes the problems of introducing a solid into a pressurised liquid line. For the digester at Kemble Farms, a small fleet of Börger pumps help keep the AD operation consistent and easy to manage. Innovations and advantages of the Börger lobe pump include hardened radial and axial wear plates which can be replaced, separate mechanical seal lubrication, low internal friction allows for short periods of dry running, available in a wide range of material options. Around 70% of Kemble Farms’ slurry (60 tons per day) is utilised for the AD process, so there is room to increase the capacity of the 300kW electrical plant. Adding more slurry at the moment though would then result in the six tonnes per day of the farm’s maize being insufficiently digested, due to digester capacity. The Börger Powerfeed pump. Click to enlarge. The weighty energy costs of running a 19-hour/day milking parlour are now covered – and two thirds of the renewable energy generated is exported to the National Grid. “Using slurry as a resource made AD a good fit for us”, continued Miles. “Subsidies were quite healthy back then – and a dairy is expensive to run. The near closed-loop system that we’ve created makes perfect sense – growing grass and maize to feed the cows, who provide the milk that we sell to a supermarket chain. The cow’s slurry we feed into the biogas digester creates our green renewable energy – and then there’s that very good quality digestate for use as a fertiliser to grow the crops. This has offset the cost of buying chemical fertiliser by a substantial amount – and has significantly improved the quality of the farm’s soil. The digestate is an excellent product – easy to spread. “Together with the Powerfeed and the BioSelect Digestate/ manure Separator, this equipment has played an important part in seeing our gas yields go up, and our maintenance costs go down. There’s nothing flimsy at all about the Börger equipment. 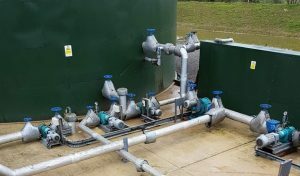 It is very well engineered – and now, when we see that digestate/ manure Separator up on its platform, it gives us great reassurance that we are running this plant at optimum levels”. Visit the Börger website here for more information.